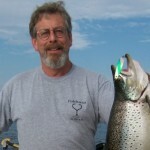 Lake Ontario Salmon Fishing…, Valuable Filets! 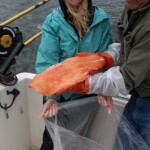 Check online..., the cheapest king salmon filets you'll find..., $20/lb!!! Have You Checked the Price of Fish Lately! If you have checked the cost of fish lately, you’ll agree that prices have soared in recent years. Just for fun, I crunched some numbers to get an estimate of the value of the trout and salmon filets Fish Doctor anglers harvested from Lake Ontario last seasonFirst and foremost, you have to remember that trout and salmon caught in Lake Ontario cannot be sold…, you have to catch them yourself or have the good fortune of being given them by a VERY good friend! Sooo…, the last time I checked at the grocery store, the only salmon available were farm raised Atlantics at $7.40/lb., O.K. eating, but no comparison to fresh, wild Lake Ontario salmon. The only trout were some pale, pathetic looking things about 12” long that looked like they might have been rainbow trout with more skin and bones than anything else. I didn’t even bother looking at the price. To get a price on chinook or king salmon, I went online and found fresh frozen Alaskan chinook available at $19.95 to $36.95, plus postage!Now things were starting to come into focus! I figured that Fish Doctor anglers caught an average of 8 trout and salmon per trip conservatively averaging 8 lbs., with each fish yielding 4 lbs. of filets for a total of 32 lbs. of filets per trip. With trout and salmon filets ranging roughly between $8 and $20 per pound, the value of the filets that Fish Doctor anglers caught per trip was somewhere between $256 and $640. A group of anglers who boated 8 kings averaging 20 lbs. each, would have walked away with about 80 lbs. of filets, which would have cost them a minimum of $1600 had they purchased them online! Whew!!! An early June brown that fell for a tweaked Sutton. As a Lake Ontario charter captain with 30 years of experience under my keel, I’ve been asked many times, “If you had only one spoon to use in Lake Ontario for trout and salmon, what would it be?” Well, to answer that, I’ll take it one step farther. If I had only one spoon to use for trout and salmon anywhere on a flatline, leadcore or copper line, or a downrigger or Dipsy, , it would be an ultralight flutter spoon called a Sutton, in Size #44. If I could select a few different sizes of Suttons, I would add the #31, #71, #88 and #38. The first time I fished Lake Ontario in September, 1977, with my fishing partner Mac Collins, five out of the six kings my partner and I caught were on a flat silver #88 Sutton. Since then, Sutton spoons in a variety of sizes and stock finishes, plus customized versions I concoct myself, have caught every species of trout and salmon in Lake Ontario for me including, cohos, steelhead, lake trout, domestic rainbow trout, landlocked salmon, several thousand brown trout, plus walleyes and bass. Suttons, by far, are the most popular trolling spoon for trout and salmon in New York’s Finger Lakes, where they originated many years ago, and continue to be manufactured in Naples, at the south end of Canandaigua Lake. They have had and continue to have one of the finest silver plated finishes on the market. Suttons are available in both ultralight flutterspoons and heavier casting spoons. They are available in a variety of finishes including flat and hammered silver, brass, copper, silver/brass, and silver/copper depending on the model and size. My favorite is the ultralight flutterspoon because it can be tweaked to troll properly at speeds from 1.5 – 3.0 mph. These spoons come from the factory with a light treble hook which produces good action at slow speeds. For my purposes on Lake Ontario, I replace the treble on all Sutton spoons with a single Mustad siwash hook. On my favorite, the 3” long #44 Sutton, I use a Size #1, #1/0 or #2/0 depending on the speed I’ll be trolling for different species and the spoon action I’m trying to achieve. With the factory bend and a single # 1 hook, the #44 rigged with a #1 crosslock snap on a light leader will start to spin at 2.0 mph. Small crosslock snaps improve the action of any flutterspoon at slow speeds. Rigged with the same small crosslock snap, but a 1/0 Siwash hook, the #44 will start to spin at 2.3 mph. Rig a #44 Sutton with a #2/0 Siwash hook and a #2 Sampo coastlock ball bearing snap swivel it will wobble up to about 2.7 mph. Flatten the spoon thru the middle and bend back a 3/8” length of the nose of the spoon, and it will wobble up to about 3.0 mph. One of my my favorite Suttons in Lake Ontario’s gin-clear water when it’s sunny is the stock hammered silver/brass finish. A 1/16” stripe of fluorescent orange paint along the silver edge of a hammered silver/brass Sutton produces more fish in colored water under sunny skies. A flat silver Sutton with a diagonal stripe of light blue lazer tape is one of my favorites for brown trout in clear water and low light. Your own custom touches of tape and paint are sometimes just what the doctor ordered.